TS LPCET 2019 Syllabus, TS LPCET 2019 Exam pattern, TS LPCET 2019 Eligibility Criteria, TS LPCET Exam schedule, TSLPCET Scheme of Entrance test, TSLPCET Entrance Exam Pattern, TS LPCET Pass Marks. TS LPCET 2019 notification has been released and Online applications are invited from the candidates who intend to take admission into language Pandit Training Course (LPT) in Government IASE / CTEs and Private Language Pandit Training Colleges in the State of Telangana through LPCET 2019 on the dates to be notified shortly through Computer Based Test (CBT) online mode. 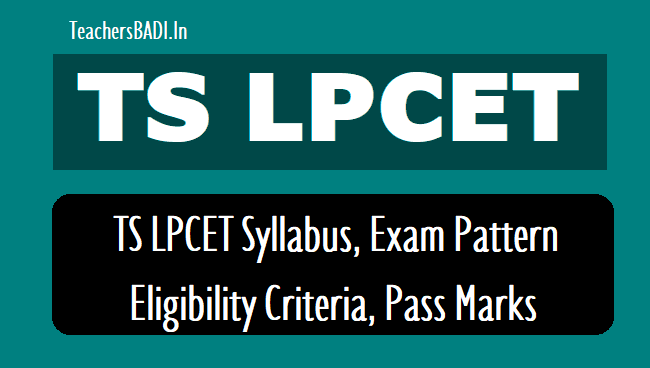 Applications will be received only through ‘ONLINE’ on LPCET 2019 website http://lpcet.cdse.telangana.gov.in from ...04.2019 to ...04.2019. The LPCET shall be conducted online at Hyderabad and Warangal on the dates to be notified shortly. B. He/She should satisfy Local / Non Local Status requirements as laid down in the Telangana Educational Institutions (Regulation and Admission Rules 1974) as amended from time to time. C. Age Limit: The candidates should have completed 19 years of age as on the 1st July of the year of admission i.e. 01.07.2019. There is no upper age limit. D. Educational Qualifications: The candidates who have passed the minimum qualifying examinations mentioned below are eligible to apply, as per G.O.Ms.No.97, Education (SE- Trg-1) Department, dt.05.12.2006 read with G.O.Ms.No.10 SCHOOL EDUCATION (TRG) DEPARTMENT Date :06.04.2019. Questions and Marks -100 questions each carry one mark (100 marks). a) Only the candidates who obtain qualifying marks in the LPCET shall be assigned ranks as per order of merit. However SC & ST candidates shall be given ranks as per merit order of marks secured by them in LPCET irrespective of qualifying mark for admission into their respective categories. b) No requests for re-totalling of marks, revaluation of answer scripts or personal verification of answer scripts will be entertained. c) The LPCET will be conducted at different examination centers to be constituted in the identified places only and not at any other place.